Running water is nice to have when you’re on the road to adventure, but many times it is awfully hard to find. 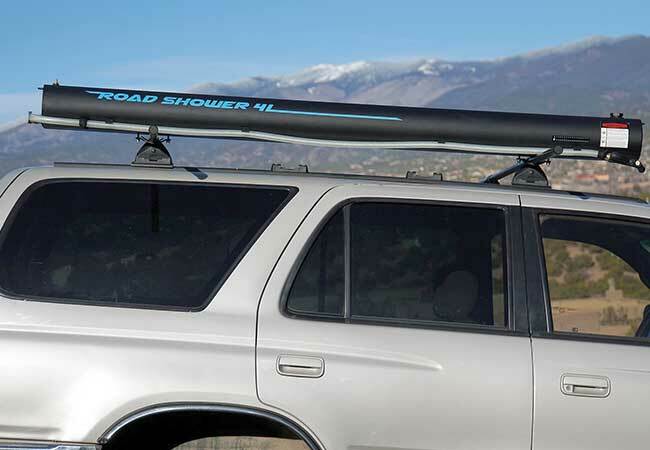 The Road Shower is like adding plumbing to the rack of your vehicle. It gives outdoors enthusiasts easy access to hot or cold pressurized water wherever the road takes them. It’s simple; mount The Road Shower to the roof rack, fill the tank with water and let the sun do the rest. With a handy temperature gauge, it’s easy to watch the progress as solar power heats the water inside at a rate of 12 to 20 degrees per hour on a sunny day. By the time you return from a trail ride or day of fishing, there could be water hotter than 100 degrees waiting for you to take a shower. But cleaning your body is just one use for this handy invention. Hot water makes cleaning the camp dishes a breeze. Good water pressure is invaluable for rinsing down muddy kayaks, boards, bikes, boots or pets. And The Road Shower can be used for drinking water as well. The Road Shower is available in 4-, 7-, or 10-gallon models. It is constructed of powdered-coated aluminum with very few extra parts, so it is extremely durable and built to last a lifetime. The unit can be pressurized automatically while filling it with a garden hose, and pressurization can also be achieved with a bike pump or other inflation tools where there is no hose available.